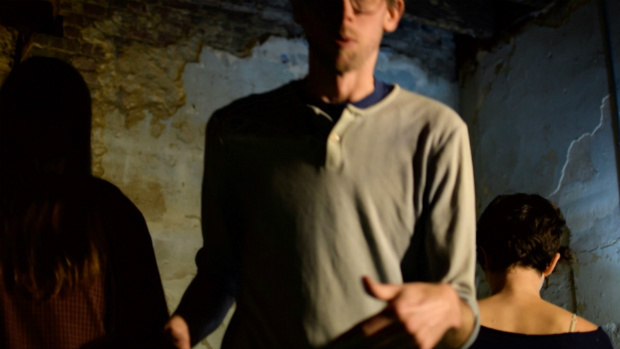 Nashville baroque pop trio The Mute Group showed off their A/V chops with the video for debut single “Brainplate in Eb.” Now, for their latest, the band have teamed up with animator Jonathan Richter to pair the track “AEIOU” with a fascinating 3D animated video. The release went live today at at 5:28 a.m., coinciding with the moment the plane of the earth’s equator passed through the center of the sun. “AEIOU” slowly rises with gentle piano lines and vocal harmonies before bursting into a solar flare of guitars and horns. The video keeps pace with animated suns flickering atop prehistoric monuments. We’re continually struck by how Richter animates the lighting to The Mute Group’s theatrical movements. The Mute Group plan to release more songs and videos while working on a full-length album this year. In the meantime, watch their video for “AEIOU” below.